The Geometroidea and Noctuoidea superfamilies contain the most species-rich families of the Lepidoptera. 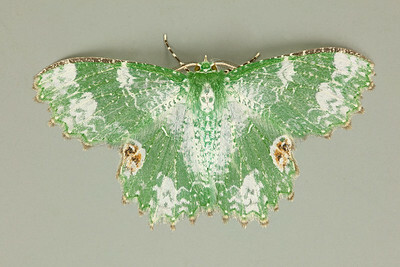 These are typically medium-sized to large moths with wingspans 12-120 mm. Geometroidea belongs to the group "Macroheterocera" which, together with the Pyraloidea, are referred to informally as the 'eared moths' since most distinctively have paired lateral tympanic organs - ultrasound detectors primarily to avoid predation by bats. The phylogeny of the Geometroidea is still in a state of flux but likely contains four families. If Uraniidae is now in its own superfamily, the Geometroidea is represented in Australia only by the Geometridae.